If we show you how to back up your PC for free, will you finally do it? Robert wants to know if Windows 7's built-in backup program is worth using. Microsoft has a history of bundling really bad backup programs with their operating systems. The company has been accused of a lot of monopolistic behavior, but their backup programs often seemed designed to not threaten the market for third-party competitors. So I wasn't prepared to like Windows 7's Backup and Restore. But much to my amazement, I kind of do. It does image backups for system protection and file backups for regular data protection--and does both for the Home Premium as well as the Business and Ultimate editions. For file backups, it defaults to backing up exactly what you should be backing up (libraries, appdata, and a few other important folders), and lets you tell it to back up any other folders you want to protect. Backup and Restore can backup files incrementally, saving only those created and changed since the last backup. And it does versioning--if several versions of a file have been backed up, you can pick which you want to restore. It defaults to restoring the most recent backup, and generally avoids the confusion that versioning causes in some people. And it's all very easy and direct. Not that it's perfect. Backup and Restore allows you to pick which drive you wish to backup to, but won't let you pick a folder in that drive. It can be pretty picky about restoring an image, to the point where I wouldn't use it for image backup. You can save to a network, but not over the Internet. If you're looking for something better, see 7 Backup Strategies for Your Data, Multimedia, and System Files. PC World Senior Editor Robert Strohmeyer (full disclosure: He's my editor) created a video showing how to set up a scheduled, automatic backup with Backup and Restore. But since I don't believe in automatic backups--at least not to local media like an external hard drive--I'll tell you how to back it up manually. 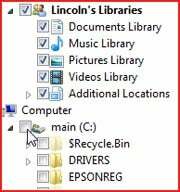 To launch the program, simply click Start, type backup, and select Backup and Restore. 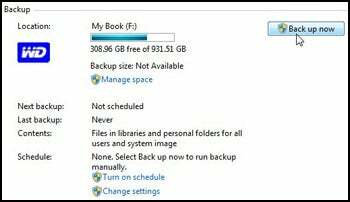 Plug in your external hard drive and click Set up backup. Make your own decisions in the setup wizard, but when you get to the last page, click Change schedule. Uncheck Run backup on a schedule (recommended), and click OK. You're set up. To back up your data (and you should do this every day), plug in the external drive, launch Backup and Restore as described above, and click Back up now. You can continue working as you back up.